Welcome back to another edition of Citadel Conversations. We recently caught up with Shawn Fagan, Chief Legal Officer of Citadel, to discuss how his team approaches helping business teams “win with integrity” for investors. Shawn oversees global legal, compliance, transaction management, and policy and regulatory affairs at the firm. He recently celebrated his 13th anniversary at the firm. You were a trial lawyer before coming to Citadel. Talk us through your background that takes you from a Court of Appeals to the Supreme Court to Citadel. When I entered my first clerkship at the Court of Appeals in Washington, D.C., I was certain that I wanted to become a professor. Like a lot of students coming out of school, part of that desire was driven by the fact that it was the world that I knew – I had spent my whole life in school. Over the course of my clerkships, I came to realize that the “real world” had more to offer me than a life as an academic. I had a thirst to engage and impact the world as it happened, rather than studying things that happened in the past. I wanted to drive real-world results and impact the law as it evolved. While I have a tremendous respect for those who teach law, I recognize that I’m most passionate about working on active legal matters, collaborating with great teams to achieve tangible and immediate outcomes that have a real impact. 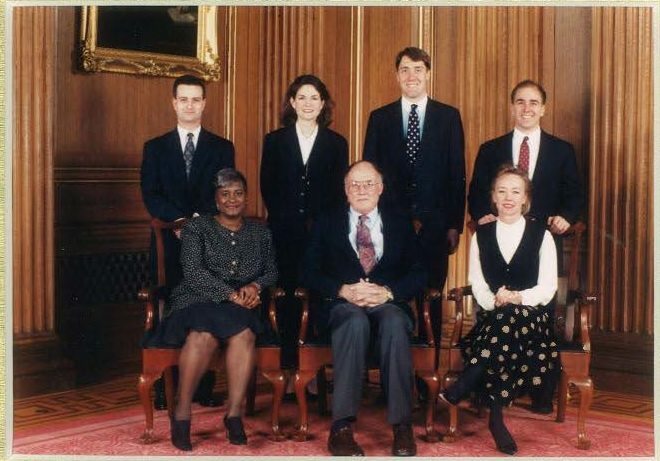 I moved on to clerking at the Supreme Court for Chief Justice William Rehnquist. My experience supporting the deliberations of the Supreme Court reinforced my beliefs about the trajectory I wanted for my career. Soon after my clerkship was complete I was called in as a juror for a trial. The trial opened my eyes to how trial lawyers could really drive real-world results. The lawyers in this trial focused on facts, people, and persuasion rather than just theoretical legal issues. At that point, I knew what I wanted to do. I have always found this quote inspirational. For ten years I honed my trial skills at that firm and tried cases all over the country, including the Bush v Gore case in Florida in 2000. I became a partner at the firm and the firm quickly grew from a start-up to be one of the premier trial firms in the country. Throughout my time as a trial lawyer, we did work for Citadel and I had the opportunity to work with the Citadel senior executive team. Now I had spent my career working with exceptional people, but the team at Citadel blew me away. When the opportunity came to join Citadel, I quickly jumped at it. I’ve now been at Citadel for more than 13 years and I’ve never looked back. The leadership team here is intelligent, results-driven, and passionate and I continue to learn from them and my own team, every day. How has your experience as a trial lawyer helped you in your current role at Citadel? I wouldn’t give back my experiences as a trial lawyer for the world. Those experiences are the foundation for what allows me to lead an exceptional team at Citadel. I can point to a number of skills that were developed through my courtroom experiences. These are the same skills that young professionals in the industry should cultivate. First, and foremost, is the ability to take in a great deal of information and quickly synthesize it into the most important points and ultimately, bottom-line conclusions. Whether you are a lawyer or a quantitative researcher or a trader, you need to be able to cut to the heart of a matter quickly and cleanly. My trial experience also taught me to take accountability for results. We come to work to win – for our clients, our partners, and in our careers. After a few trials, I realized that it feels empowering to be accountable for results. I know I speak for many colleagues from around the firm when I say I feel that same sense of empowerment at Citadel. We are a culture that looks to results. We win based on having great ideas and driving results each and every day. Finally, my time as a trial lawyer gave me an understanding about how to effectively collaborate with the best and the brightest. I loved trials because you worked as part of a small, focused team. I loved the competition that stems from squaring off against another equally focused team. I always knew another intelligent and prepared lawyer was going to challenge my ideas. This motivated me and helped me refine my arguments and ideas. What advice would you give to graduates who aspire to succeed in the financial services industry? My advice is to set yourself up to do important work every day. This industry is not for everyone. For those who want to pour themselves into understanding markets and making an impact each and every day, I think careers in this industry are incredibly fulfilling. So you choose an industry and then you choose what “important work” means to you within an industry. Follow that path. The second piece of advice I’d share is to view failure as a stone to climb on your way to the mountaintop of success. Some days you will not make it all the way to the top. Take the time to step back, analyze, and draw conclusions about why you didn’t make it to the top. These conclusions will act as helpful tools for your climbs over the days, months, and years ahead. Ken Griffin, Founder and CEO of Citadel, often speaks about how our aim is to “win with integrity.” How do you ensure Citadel wins with integrity? In one sentence, my job is to make integrity more than a word, but rather a standard by which we all hold ourselves to at the firm. I challenge my team to understand the regulatory environment as well as anticipate changes. Here’s the key though: they have to be more than experts on some intellectual level. They have to internalize that knowledge and they have to be great at communicating that ethos of integrity to our business teams. These days it is equally important to develop and implement systems and processes to help all of us consistently act with integrity. There’s a second part to winning with integrity – winning. We aim to provide proactive, thoughtful, and creative solutions to business teams to help them succeed. We’re always trying to look ahead. We hear you are a voracious reader. What are you reading right now? My girls were assigned summer reading projects in advance of starting high school in the fall. I’m reading The Martian Chronicles and The Once and Future King.